What Does Code P0338 Mean? Three things are needed for the engine to run: air, fuel, and spark. To run well, the ECM (engine control module) precisely meters how much fuel to inject for the measured mass of air at any given moment, and then deliver a spark to ignite a power stroke, hundreds of times per second. Of course, this all requires precise timing, for which the ECM uses the camshaft and crankshaft position sensors (CMP and CKP). The crankshaft position signal serves two important functions. First, it functions as a speed sensor, which the ECM uses to calculate engine speed in revolutions per minute (rpm). Second, CKP functions as a position sensor, which the ECU uses to calculate the position of cylinder #1 at top-dead-center (TDC). The ECU uses rpm and TDC measurements to calculate injector pulse width (IPW), ignition timing, and variable valve timing (VVT), among other things, and can even detect cylinder misfires. If ECU detects too much voltage coming from the CKP sensor, it sets DTC P0338 Crankshaft Position Sensor “A” Circuit High Input. What are the common causes of code P0338 ? DTC P0338 may have number of causes. Here are some of the most common. Dead CKP Sensor – Because the sensor is typically not a high-price item, some suggest “just replacing” the sensor as a matter of course. We always suggest fully diagnosing the system before condemning the sensor. It’s true that sensors fail over time, but it’s also true that a poor connection can set the same code. Do your homework, and you won’t have to kick yourself for spending $100 on a new sensor when a $2 soldering job would have fixed the problem. 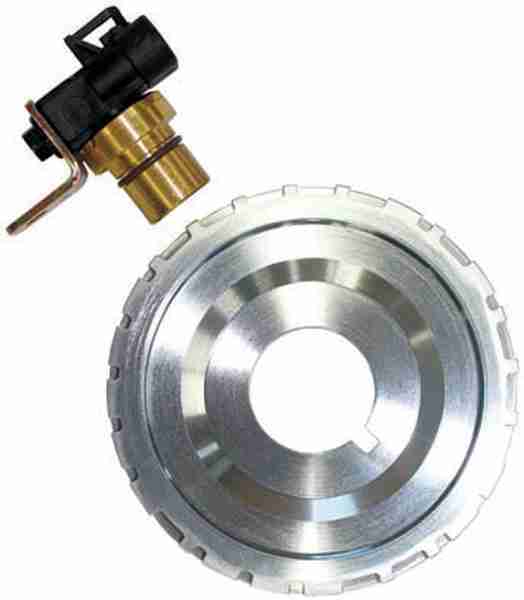 Poorly Aligned Sensor – Generally-speaking, the air gap between the sensor and reluctor wheel are fixed. Sometimes, there may be a gap adjustment, in the form of a bolt slot (instead of a round hole) or a pinch bolt. In this case, you need to measure, usually 0.02-0.06 inches, or the thickness of a credit card. Some new sensors come with a piece of paper stuck to the end, which is the right thickness for the air gap. Install these sensors “flush,” making sure it’s resting on one of the teeth. Rotate the engine by hand to make sure there is no interference. A poorly installed sensor will either be destroyed on startup or generate a poor signal. Electrical Problems – As with all ECM/Sensor relationships, the ECM depends on a clean CKP signal. Open or short circuits, damaged harnesses, or water damage are all par for the course. Always make sure you have a good harness before you condemn a sensor or ECM. What are the symptoms of code P0338 ? Depending on configuration, the ECM may or may not be able to start the engine without a reliable CKP signal. In some cases, you may not notice any symptoms at all, because some ECMs can estimate CKP, calculating it from CMP measurements. At a minimum, you will notice poor fuel economy, since the ECU is running in “limp-home” mode. On the other hand, the engine may need to crank a long time to start, or may not start at all. Other conditions might include a lack of engine power, poor acceleration, engine misfire, or engine stalling. How do you troubleshoot code P0338 ? There are two types of CKP sensors, hall effect and magnetic, each one generating a different type of signal to the ECM. In both cases, diagnosis and repair are pretty similar. Signal Check – Depending on the scan tool and other diagnostic tools you have available, you may or may not be able to directly read the signal from the sensor. Some DMM (digital multi-meters) have basic digital oscilloscope functions, which can read a lot of vehicles sensors, including both magnetic and hall-effect crank position sensors. In the following cases, if you cannot detect a CKP signal at the ECM, the likely problem is either the sensor itself or the harness. Hall Effect – The hall effect sensor generates a digital signal, known as a square wave. On a ‘scope, it looks square, hence the name. Generally, a hall effect CKP either generates a signal or doesn’t. Each pulse should be +5 V. If you measure less than 5 V each pulse, suspect excess resistance in the harness (corrosion). If you see no signal at the ECM, suspect a faulty sensor or open circuit in the harness. To check the sensor itself, it needs to be plugged in. Don’t forget that a Hall Effect CKP needs a +5 V reference voltage to function. If there is a +5 V reference and you still see no pulse while cranking, the most likely cause is a defective sensor, though this doesn’t rule out a mechanical problem, such as a broken reluctor wheel. Magnetic – The magnetic sensor generates an analogue signal, that is, a signal that switches positive to negative. Generally, a magnetic CKP generates a signal that varies between ±2 V to ±5 V. It’s not exactly an AC Sine Wave, but it looks similar on the scope. If you measure less than ±2 V, but a good signal otherwise, suspect that the CKP isn’t installed correctly (excess gap) or extra resistance in the harness (corrosion). If you see no signal at all, suspect a faulty sensor or open circuit in the harness. Mechanical problems are slightly less common. You can test a magnetic CKP directly by disconnecting it from the harness. Again, look for at least ±2 V. If less, make sure the sensor isn’t cocked to the side or loose. If you have no signal here, replace the sensor. Harness Check – If you can rule out the sensor, you will need to check for circuit problems in the wiring harness, between the ECM and CKP sensor. Keep in mind that Hall Effect sensors have at least two wires going to the ECM: a +5 V reference and the signal wire, perhaps a third, if it isn’t grounded directly to the block. 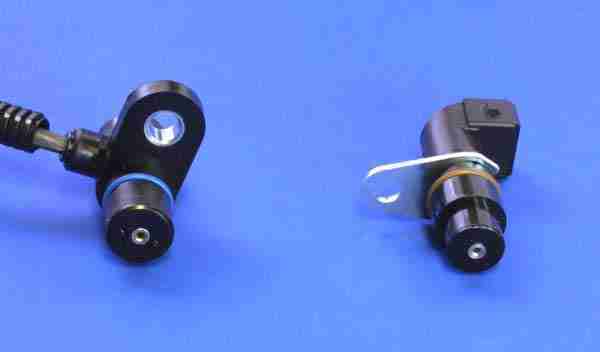 Magnetic CKP sensors will have two wires going to the ECM.